Last week I briefly reported on Google+ that I had written a Go-based Native Client module, built it with llgo, and successfully loaded it into Google Chrome. I'd like to expand on this a little now, and describe how to build and run it. If you want to want to try this out yourself, then you'll need to grab yourself a copy of the Native Client SDK. I've only tested this on Ubuntu Linux 12.10 (x86-64), so if you're trying this out on a different OS/arch you may need to alter the instructions. This is not a small download, so go and brew some tea, or just read on to see where we're going with this. By now I guess you probably know what Native Client is, but if you don't, I suggest you take a moment to read about it on the Google Developers (https://developers.google.com/native-client/) site. What may not be so well known is PNaCl, the next evolution of Native Client. PNaCl (pronounced pinnacle), is short for Portable Native Client, and is based on LLVM. Developers continue to write their code the same as in traditional NaCl, but now it is compiled to LLVM bitcode; PNaCl restricts usage to a portable subset of bitcode so that it can then be translated to native x86, x86-64, or ARM machine code. To compile C or C++ modules to PNaCl/LLVM bitcode, one uses the pnacl-clang compiler provided with the Native Client SDK. 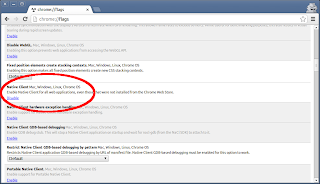 To make use of Native Client, one develops a module, which is an executable, that can be loaded into Google Chrome (or Chromium). A module implements certain functions specified in the Pepper API (PPAPI), which is the API that interfaces your module with the browser. One of the functions is PPP_InitializeModule, and another is PPP_GetInterface. The former provides a function pointer to the module for calling back into the browser; the latter is invoked to interrogate the module for interfaces that it implements. Since llgo speaks LLVM, it should be feasible to write PNaCl modules in Go, right? Right! So I set about doing this last week, and found that it was fairly easy to do. I have written a demo module which you can find here: https://github.com/axw/llgo/tree/master/pkg/nacl/ppapi, which I later intend to morph into a reusable Go package, with a proper API. I have made a lot of shortcuts, and the code is not particularly idiomatic Go; bear in mind that llgo is still quite immature, and that this is mostly a proof of concept. Most of the code in the package is scaffolding; the example module is mostly defined in example.go, some also in ppapi.go. At the top of example.go, we instantiate a pppInstance1_1, which is a structure which defines the “Instance” interface. This interface is used to communicate the lifecycle of an instance of the module; when a module is loaded in a web page, then this interface is invoked. We care about when a module instance is created, and when it is attached to a view (i.e. the area of the page which contains the module). Note that when I say interface, I mean a PPAPI interface, not a Go interface. Later, I hope to have modules implement Go interfaces, and hide the translation to PPAPI interfaces. The example is contrived, and quite simple; it demonstrates the use of the Graphics2D interface, which, as the name suggests, enables a module to perform 2D graphics operations. The demo simply draws repeating rectangles of different colours, animated by regularly updating the graphics context and shifting the pixels on each iteration. I would have used the standard “image” Go package, but unfortunately llgo is currently having trouble compiling it. I'll look into that soon. Build llgo, and related tools. Compile the PNaCl-module Go code into an LLVM module. Link the llgo runtime into the module. Link the ppapi library from the Native Client SDK into the module. *The final step is currently necessary, but eventually Chrome/Chromium will perform the translation in the browser. The llgo-dist tool takes two options: -llvm-config, and -triple. The former is the path to the llvm-config tool, and defaults to simply “llvm-config” (i.e. find it using PATH). The latter is the LLVM target triple used for compiling the runtime package (and other core packages, like syscall). The Native Client SDK contains an llvm-config and the shared library that we need to link with to use LLVM's C API. At this point, you should put the “host_<arch>/bin” directory in your PATH, and the “host_<arch>/lib” directory in your LD_LIBRARY_PATH, as llgo currently requires it, and I refer to executables without their full paths in some cases. The Native Client SDK creates shared libraries with the target armv7-none-linux-gnueabi, so we'll do the same. Let's go ahead and build llgo now. We now have a compiler, linker, and runtime. As an aside, on my laptop it took about 2.5s to build, which is great! The gc toolchain is a wonderful thing. You can safely ignore the warning about “different data layouts” when llgo-dist compiles the syscall package, as we will not be using the syscall package in our example. This creates a file called “main.o”, which contains the LLVM bitcode for the module. Next, we'll link in the runtime. Eventually, I hope that the “go” tool will be able to support llgo (I have hacked mine up to do this), but for now you're going to have to do this manually. Now we have a module with the runtime linked in. The llgo runtime defines things like functions for appending to slices, manipulating maps, etc. Later, it will contain a more sophisticated memory allocator, a garbage collector runtime, and a goroutine scheduler. That's it. If you want to load this in an x86 or ARM system, you'll also need to translate the pexe to an x86 and/or ARM nexe. Now we can run it. I'm not sure at what point all the necessary parts became available in Chrome/Chromium, so I'll just say what I'm running: I have added the Google Chrome PPA, and installed google-chrome-beta. This is currently at version 24.0.1312.35 beta. By default, Chrome only allows Native Client modules to load from the Chrome Web Store, but you can override this by mucking about in about:flags. 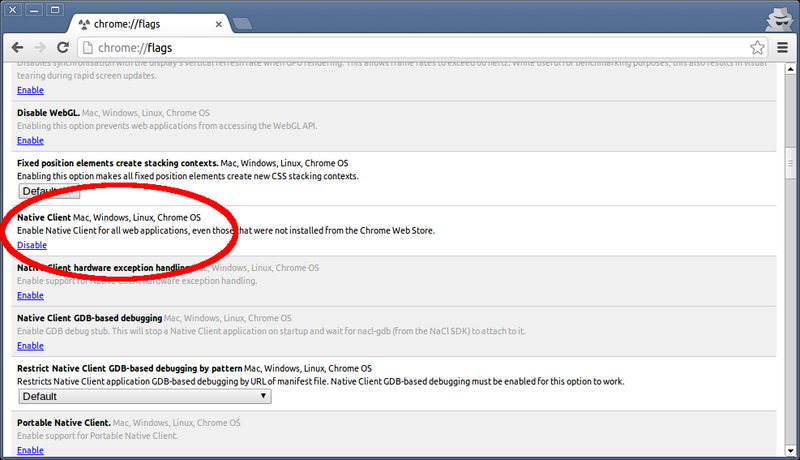 Load up Chrome, go to about:flags, enable “Native Client”, and restart Chrome so the change takes effect. Curiously, there's a “Portable Native Client” flag; it may be that the translator is already inside Chrome, but I'm not aware of how to use it. To simplify matters, I'm going to hijack the hello_world example in the Native Client SDK. If you want to start from scratch, refer to the Native Client SDK documentation. 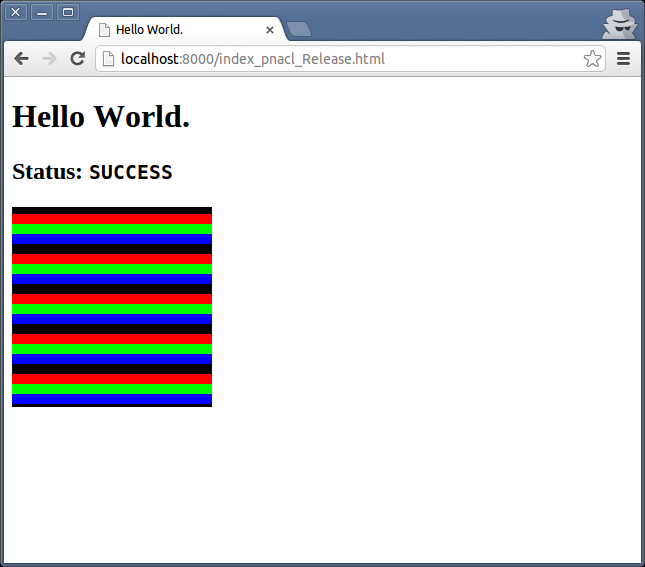 So anyway we'll build the hello_world example, then replace the executable with our own one. Behold, animated bars! Obviously the example is awfully simplistic, but the I wanted to get this out so others can start playing with it. I'm not really in the business of fancy graphics, so I'll leave more impressive demos to others. Clean up nacl/ppapi, providing an external API. Update llgo-link to transform a “main” function into a global constructor (i.e. an “init” function) when compiling for PNaCl. Update llgo-link to link in libppapi_stub.a when compiling for PNaCl, so we don't need to use pnacl-clang. Ideally we should be able to “go build”, and have that immediately ready to be loaded into Chrome. Get the image package to build, and update nacl/ppapi to use it. Implement syscall for PNaCl. This will probably involve calling standard POSIX C functions, like read, write, mmap, etc. Native Client code is heavily sandboxed, but provides familiar POSIX APIs to do things like file I/O. If you play around with this and produce something interesting, please let me know. That's all for now – have fun! Oops. I moved some stuff around a while ago, and never updated this. Thanks. I updated the build instructions too, though I'm not confident everything will work as well as it did when I wrote the post. Things have moved since then. When Go 1.1 is released, I will be in a position to pull some changes across to the llgo master repository that should put things right.